We've just learned the big fire that started near Henvey Inlet has grown a lot bigger over the last day ... growing to more than 6,700 hectares from 5,600 when it was measured yesterday. The winds have become an issue for firefighters on the ground there. Shifting winds were an unexpected challenge yesterday for fire fighters working Parry Sound 33. That forest fire has been burning for over a week now, and while the MNRF said this week's rain was a help, the fire picked up again Wednesday. There are seven new fires since we last spoke. Two are in the Sioux Outlook district. Both are small -- 0.1 hectares and 0.2 hectares -- and were both caused by lightning. They are not under control. Another cluster of fires are in a line south of highway 11, between Hearst and Greenstone. A fire south of Hearst is 2 hectares, started by lightning and is not under control. Over in the Wawa district, a small 0.1 hectare fire is now under control. The cause is unknown. Finally, a fire south of Longlac is being held. It is 0.2 hectares and was also caused by ... lightning! There's a fire near Thornbury Lake in the Nipigon district that's not under control. It is larger compared to most new fires ... 20 hectares in size and was also caused by lightning. Finally, there's another new fire in the Nipigon district though much more north, just below Greig Lake. It was also caused by lightning, 0.2 hectares in size and is not under control. John Bell has has been going to a family cottage on Georgian Bay for 15 years. The cottage was in the path of the fire and 80 per cent of the trees on his property have been burned. The fire came within a few metres of his structures but they were saved thanks to the quick work of a neighbour who got up in the middle of the night with a fire pump. "There are the skeletal remains of trees and a loss of wildlife," he said. "The landscape has been destroyed for at least many generations ... that is deeply disturbing and upsetting." Listen to CBC's interview with Bell here. The provincial park is open to the public but nine back country campsites in the park are closed. The park said car-campers who are worried about the forest fires and "wish to cancel their reservation will be given a full refund or the opportunity to change their reservation." CBC reporter Chris Ensing met Angele Dubois. The community where she holds her camp is where Parry Sound 33 is centred. But that hasn't stopped her. You can see the air is smoky by the provincial park. What about the larger fires? While we've heard all about Parry Sound 33 and Kenora 71, there are some fires burning in Ontario that are much large than those two. Nipigon 30 is out of control. 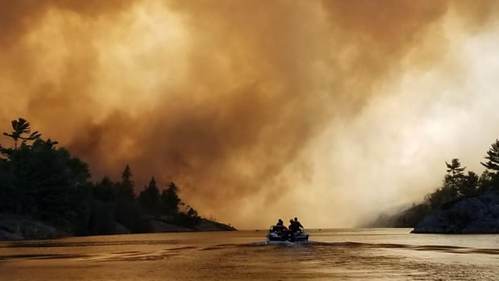 It is burning on Wapikopa Lake and measures 32,850.5 hectares. Red Lake 38 is being observed and has been burning since mid June. It measures 28,217.1 hectares and is near Wokootai Lake. When it comes to these fires in remote areas, forest fire scientist Mike Wotton said just letting them burn is not a bad thing. "If they can just burn, you want them to just burn because firing will be playing its natural role. Since long before we came here, it was playing this role as a disturbance agent in the forest," he said. It can be a challenge as a responder. He said you have to decide whether you put resources in more remote communities or just let it burn. To give you context, this is about part way between Parry Sound and Sudbury. Greece is having a deadly summer of fires. One forest fire there has killed at least 83 people. No one has died in the northern Ontario fires but there are some similarities and differences between the two. "They are in a real extreme heat," forest fire scientist Mike Wotton said of Greece. "The population density is different as well." "Those fires that were burning there were spreading very quickly, growing very large and doing so in an area with a greater population density so putting people at risk. That presents a real challenging situation." It's not just the north that is burning. 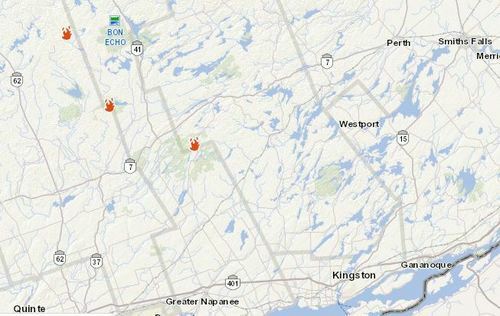 There's a small cluster of fires northwest of Kingston, by Bon Echo Provincial Park. They are all under control, but it's interesting to note that it's not just up north where these fires can happen. The biggest is just west of Whitefish Lake in Bancroft district. It was started up by lightning and measures 11.5 hectares in size. A nice message from the Canadian border services for northern Ontario to the Mexican crews here to fight the fires. Here's their story. 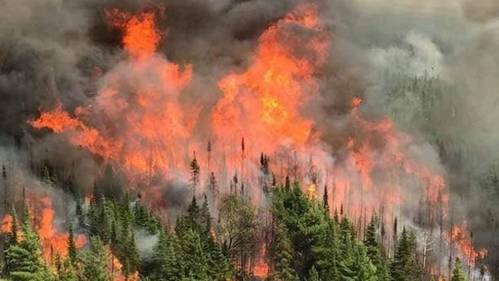 We had a nice chat with Mike Wotton, a forest fire scientist and fire professor about the fire conditions in northern Ontario and around the world on Facebook, Twitter and YouTube. You can recap the conversation below. We're hosting a live Q&A about the forest fires this afternoon with Mike Wotton, a forest fire scientist with Natural Resources Canada and a self-proclaimed professor of fire at the University of Toronto. You can send in your questions by responding to this tweet. We'll also be streaming it in this blog. So check back in around 2 p.m. this afternoon for that. In the northwest, there's a much bigger fire blazing called Kenora 71. The fire is burning northwest of Kenora near the Manitoba border and remains out of control. It's current size is 10,887 hectares and it has been burning since July 15. 20 firefighters from Minnesota were sent to fight that particular blaze. You can read more about that below. Crews fighting Kenora Fire 71 will get some help from their neighbours to the south. Some thoughts and observations from Jim Rook, councillor in Killarney. He said Parry Sound 33's fire movement will be based on what way the wind is blowing today and its speed. They are hoping it will stay south of the Pickerel River. He said the Killarney Municipal Emergency Management Group will be meeting with ministry and Ontario Emergency Management executives to try and figure out a plan and support system for residents and businesses. That's the big fire between Parry Sound and Sudbury that started last week near Henvey Inlet. It's grown to more than 5,600 hectares in size. The rain has been a help but winds have caused it to flare up again and it remains out of control. "Stronger, warmer and drier lake effect winds than had been forecasted came from the southwest contributing to the increased activity. As a result, smoke was pushed across Highway 69 and into some communities to the east of the fire." Shifting winds were an unexpected challenge yesterday for fire fighters working Parry Sound 33. That 5,600-hectare forest fire has been burning for over a week now, and while the MNRF said this week's rain was a help, the fire picked up again Wednesday. We've got another day of live blog coverage for you, with the latest on the forest fires in northern Ontario. Here's the situation right now. Note that the red flames are active fires, where the yellow flames represent new fires. You can take a look at the forest fires map here.